I am doing my very best at eating clean now that I have completed my cleanse. And I’ve got to say, I think I’m killing it! I made it through the weekend, Pats playoff game included without eating crap and actually without overeating at all. Although I didn’t hit the gym, but I can only handle one hurdle at a time, so I won’t beat myself up too much. Does beating myself up count as a workout? Well, it should. One of my biggest challenges during the week, as I am sure it is for most, is time. Like, not enough of it. I typically spend my Sunday getting ready for the week. Prepping food, cleaning the house, looking at everyone’s schedules and trying to get a mental picture of our week. Now that I am hitting the gym, it is even more important to get as much done before the Monday chaos begins. Today, I’m going to share with you a simple recipe that can help you through the week. It takes very little preparation and you aren’t standing over the stove cooking, so you can be taking care of other things. It is a simple roasted chicken. Even if you aren’t a “cook” you can easily tackle this and have fresh, healthy, tender chicken for sandwiches, enchiladas, salads, whatever. I must tell you first, if you are cooking meat, you need a good meat thermometer. It is a must! Each piece of meat is different. Every oven is different. Times and temps here are just guidelines. I use the Thermapen. It is a bit pricey, but worth it. I got mine as a gift from the hubby. He digs gadgets. He comes home with some pretty cool stuff that I typically raise my nose at and ask him what he was thinking, then when he isn’t looking I hug it and ask it how I ever got through my life without it. Like this shirt folder, which by the way, is fun for the whole family. We had shirt folding races on New Year’s Eve. Yah, I know. You wish you lived my life. I get that aaaaaalllll the time! NOT! But okay, back to the chicken. To make sure it stays nice and juicy, a quick brining step is all you need. Combine 1/2 cup salt and 2 quarts of water in a large stockpot and stir to dissolve. Place the chicken in the brine and cover. My pot was small enough that the entire bird was submerged, but you may want to flip it halfway through to make sure the entire bird gets covered. Cover and refrigerate 1 hour. Remove the bird from the brine and pat dry. Brush entire bird with 2 tablespoons melted butter and season with salt and pepper. You can add some herbs or lemon to the cavity if you wish, but it’s all up to you. I don’t. But that’s just me. Preheat oven to 375F and place the bird in a roasting pan, breast side down. Cook for 15 minutes then turn the chicken so it is breast side up and increase the oven temp to 450F. 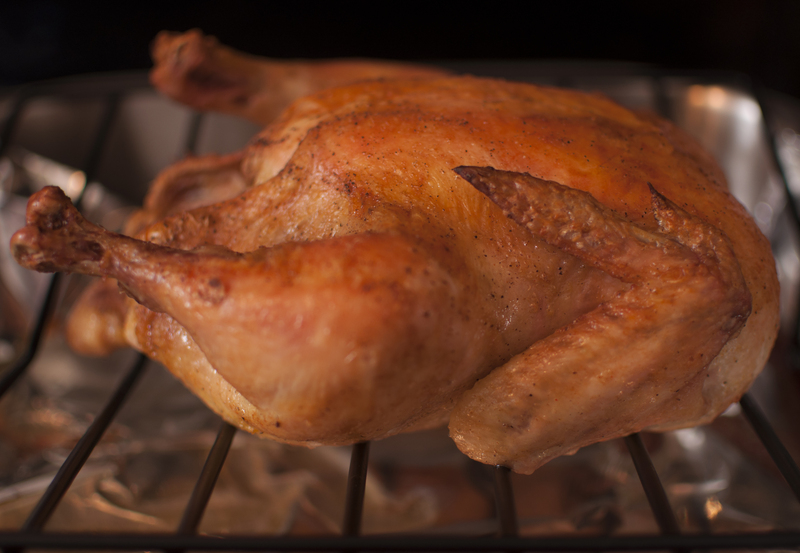 Roast until and instant-read thermometer reads 160F in the breast and around 170F in the thigh, about 30-35 minutes. Again, this is where an instant-read thermometer comes in. It is an essential kitchen tool. Nothing worse than cutting into a pink chicken. Grody! Once chicken is cooled, pick the meat off the bones and shred with 2 forks and store in the fridge for use during the week or it makes a great quick dinner as well. Some mashed potatoes and a vegetable and voila! Dinner!